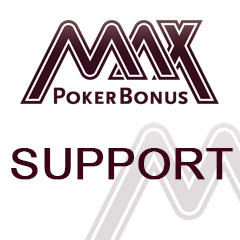 MaxPokerBonus.com is a subsidiary of Visual Sense Marketing. Please feel free to contact us with comments and suggestions, as we are always looking to enhance the quality of our site and its content. You can always contact us with any questions, ideas or problems (of course we also gladly will accept a simple praise in any form…), no matter whether it is something concerning us or a poker room that we advertise. We will process all your requests as quickly as possible. Please attempt to give a brief and concise outline of your reason for contacting us in order to allow us to help you in the most efficient way. We will never need any passwords or other sensitive data of your poker accounts at any time. If you do encounter problems with a specific poker room, please simply give us your nickname with that room and depict your problem as well as your steps so far regarding that matter. We will contact the poker room with this information and try to resolve everything as quickly as possible.